Orange’s Jalen Bethel drives against Liberty’s Ben Roderick (3) during an OCC showdown last season. Bethel and Roderick return as their respective teams’ leading scorers. Calo, who is entering his sixth season at the helm of Orange, really likes the mix of youth and experience on this year’s team. Orange finished 8-15 overall and 1-9 in the OCC-Buckeye after a 5-2 start last year. Orange has a wealth of experience, including seniors Manny Anderson, Jack Betz, Jack Neer, Matt McCollum, Jalen Bethel and Jordan Shelton. Bethel is the Pioneers’ top returning scorer from last season. Juniors Luke Ballinger, Bryson Lane and Nik Brannon all saw some time at the varsity level last season. Calo says all three will see significant time this season. Sophomore Elijah Meredith saw limited action last season. Sophomore Ryan Cutler and freshman Andre Irvin are newcomers that could see some time this season as well. Calo said he’s not focusing on what fellow OCC-Buckeye teams like Olentangy, Olentangy Liberty and Westervilles North, South and Central are doing. He’s trying to keep the team focused internally. Orange opens on the road at New Albany (Dec. 1) and Buckeye Valley (Dec. 2). Big Walnut (away Dec. 19), St. Charles (away Dec. 23), Walnut Ridge (away Dec. 30) and Dublin Coffman (home Jan. 23) highlight the non-league slate. Take a look at the Olentangy Liberty boys basketball team every year and there’s sure to be some multi-sport athletes … and this year’s no different. Four of Liberty’s top players are key members of the football team, which wrapped up an OCC-Buckeye title and made it to the D-I state semifinals for a second straight season. “Success breeds success,” said Greg Nossaman, who is entering his 10th season at the helm of the Patriots. He thinks Ben Roderick, Mitchell Kershner, Mitchell Okuley and Grant Wilson are all learning valuable lessons from football coach Steve Hale and his program. Liberty doesn’t have the luxury of moving games around this season. It opens with Mentor in the All-Ohio Nike High School Hoops Showcase Dec. 2 at Whitehall-Yearling High School. Mentor just so happens to be Liberty’s opponent in the football state semifinals, something Nossaman is well aware of. Despite not having his full complement of players for preseason practice, Nossaman likes his team’s chemistry. It’s a roster mostly made up of juniors – eight of 13, in fact. Roderick was the team’s leading scorer and rebounder last season. He’s been a key contributor on varsity since his freshman year, but really took on the scoring load last season. “He’s gotten taller, he’s gotten stronger and he’s learned to compete harder,” Nossaman said. “He comes in before school and gets shots up even though it’s football season. Roderick isn’t the only weapon in Liberty’s arsenal. 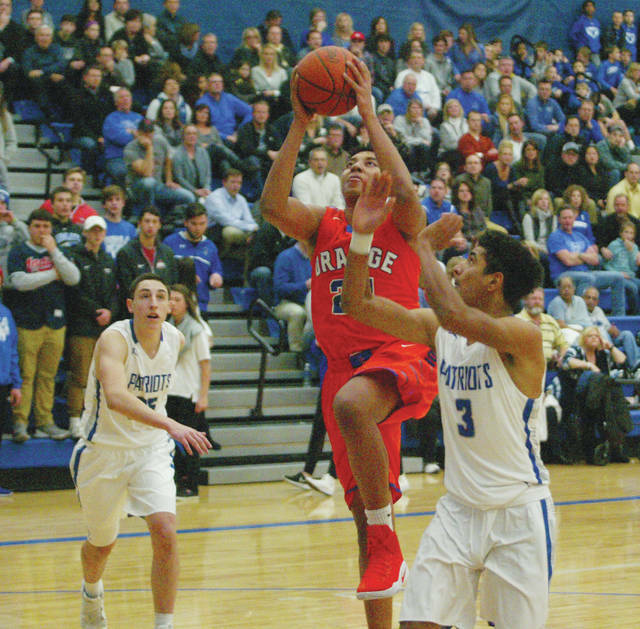 Kershner and Nick Nakasian each played big roles last season, which saw the Patriots improve to 15-9 overall on the way to a district semifinal appearance. Nossaman needs them to up the ante, though. “Their point production has to increase, their rebounding has to increase, their maturity and their leadership has to increase,” Nossaman said. Liberty has to replace its point guard and find some depth in the post. Nossaman sees the point guard position as having himself on the floor. Junior Joey Thatcher filled that role on the JV squad last season and freshman Henry Hinkle will provide depth. Llwyatt Hofer is another junior who saw significant time in the post last season. Post Dan McFarland is the only senior on the roster. Liberty’s schedule is tournament and showcase heavy in the non-conference. The Patriots travel to North Allegheny (PA) over the winter break in late December for a tournament. They also play Xenia in the Flying to the Hoop showcase in Dayton and Dublin Coffman in the Jared Sullinger Classic at Ohio Dominican Jan. 27 to go along with the opener against Mentor. “We have some really good teams in our non-league. That’s what we want to do – we want to play good non-league teams,” Nossaman said.